Quick drying solution that seals and stabilises powdery, chalky or dusty weathered exterior surfaces, prior to painting. Ensures good adhesion of masonry paint. 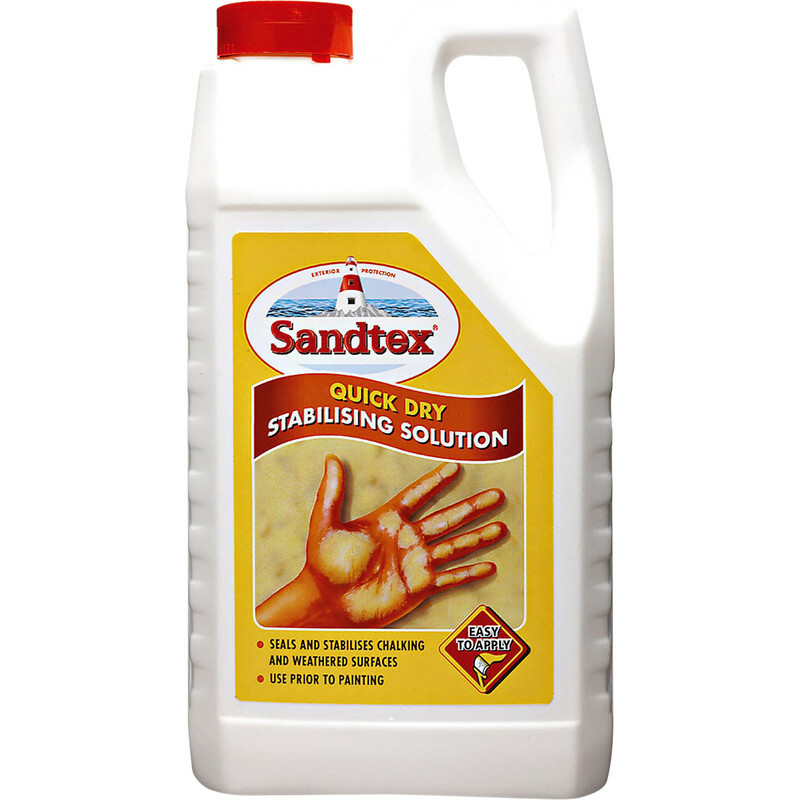 Sandtex Stabilising Solution 4L is rated 4.8 out of 5 by 10. Rated 5 out of 5 by One Fatboy from Used on new rendering One coat of this then two of Sandex white smooth. Job done. Rated 5 out of 5 by JULIAN64 from made painting easy I had bought some last year did not get round to doing job so it had gone off into a large lump. Ordered online a new tub got it next day and used it straight away. went on well, even had some left so went far. Paint went on so easy and the walls look great. Very pleased. Rated 5 out of 5 by frank7 from brilliant product This product sealed the masonry prior to painting and made application easier to paint as it sealed the walls beforehand. Rated 4 out of 5 by Brian101 from Good product Did what it said sealed and dried quickly. Rated 5 out of 5 by Kookie from The Best Many many moons ago I was advised to coat my external walls with Santex Stabilising solution prior to painting. Over 20 years later a couple of areas started flaking away so I purchased some DIY branded stuff thinking it would be as good. Wrong last year the frost got underneath it so I am starting back to square one once again by using the Sandtex brand again! Rated 5 out of 5 by oldjimmy from Does the job. I used this to seal a stripped rendered wall which was powdery.